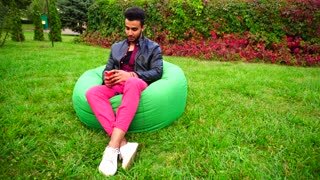 Stately Muslim Male Entrepreneur Takes Out Phone and Answers Call, Talking on Mobile, Smiling and Sitting in Chair in Garden Outdoors. Cute Muslim Young Guy Holding Phone in Hands, Smiling, Decided to Call and Sitting in Chair in Garden Outdoors. Arabian Young Adult Entrepreneur Sits With Laptop in Chair, Rejoices, Stares at Laptop Screen, Raises Hands, Making Gesture "yes!" in Garden Outdoors. Muslim Guy, Businessman Uses Smartphone and Holds Phone in Hand, Corrects Hair and Sits in Chair on Background of Lawn in Garden Outdoors. Attractive Muslim Man Corrects Bracelet on Arm and Looking Around, Waiting For Meeting and Sits in Chair in Garden Outdoors. Successful Arabic Entrepreneur Sits With Laptop in Chair, Stares at Laptop Screen, Raises Hands, Making Hand Gesture "yes!" in Garden Outdoors. 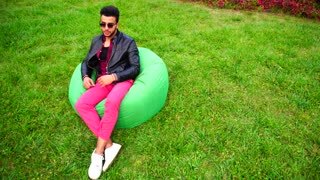 Beautiful Young Arabic Man Holds in Hands Mobile Phone, Calls up on Skype and Sits in Chair in Garden Outdoors.